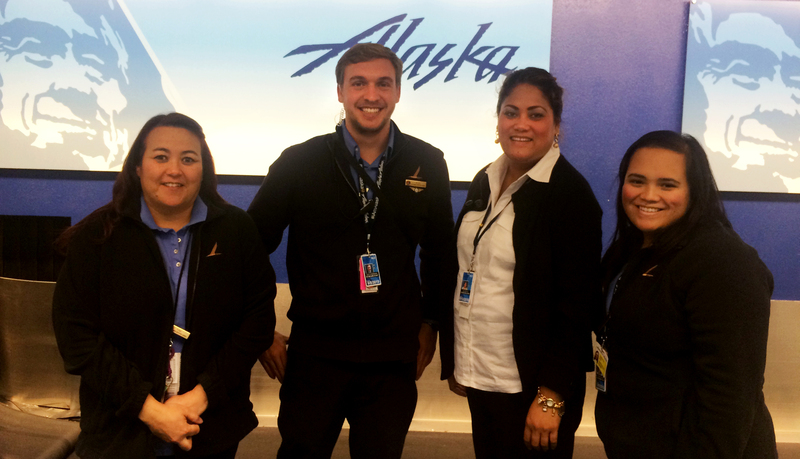 Alaska’s Salt Lake City team helped a customer get home as fast as possible during an emergency. Alec Robinson (second from left) was the ticket-counter lead that day. 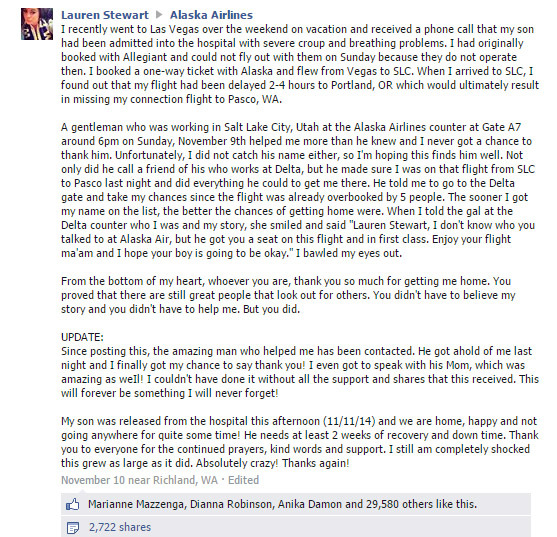 When a mom in Las Vegas needed to reach her son in eastern Washington, Alaska Airlines’ Salt Lake City team used some “Alaska spirit” to help her get home as fast as possible, even though it meant putting her on a different airline’s flight. Lauren Stewart was on vacation in Las Vegas when she found out that her 7-year-old son, Ryder, was in critical condition with breathing trouble in a Pasco hospital. 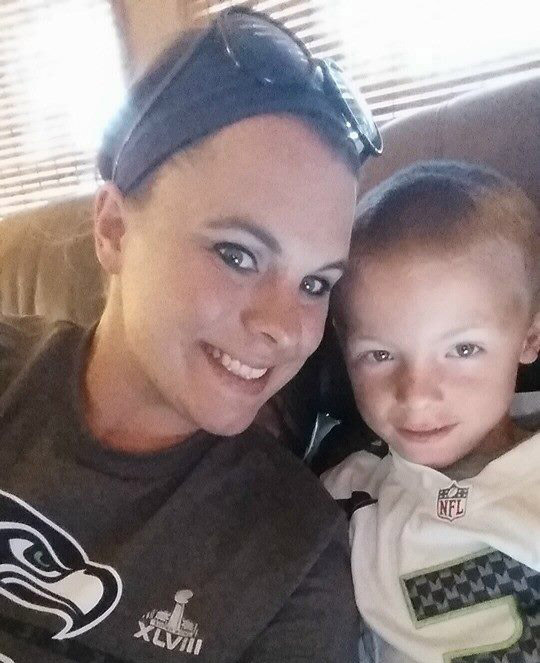 Lauren Stewart was on vacation in Las Vegas when she found out that her 7-year-old son, Ryder, was in critical condition with breathing trouble in a Pasco, Washington, hospital. Ryder was born two months premature, but had never had respiratory issues to this extent before. A Kennewick, Washington native, Stewart said this was only the fifth time she’s ever flown. Stewart had originally booked travel home to Kennewick on a different carrier, but since they didn’t operate the day she needed to fly, she bought a one-way ticket on Alaska, which included a layover in Salt Lake City. When she arrived in Salt Lake City, she learned her flight to Portland, Oregon, on another carrier was delayed, so she missed her connecting flights home to Pasco. Customer Service Lead Alec Robinson was the ticket-counter lead in Salt Lake City that day. Stewart’s flight was the last departure of the night. While waiting to greet the incoming flight, Robinson decided to help Alaska customers at the gate. The customer service agent assisting Stewart, Sam Moa, pulled Robinson aside and explained that the flight was full and was unsure how they were going to get Lauren home that night. Realizing how important it was that they help Stewart, Robinson reached out to his friends at another airline in Salt Lake City. Robinson told Stewart to go to that airline’s ticket counter and see if she could get her name on the list for their flight to Pasco. Robinson said that he appreciates the opportunity to assist Alaska customers when their flights are delayed. Stewart made it home in time to be with Ryder in the hospital. He has since been discharged and returned to school the week of Thanksgiving. Lauren Stewart posted her story on Facebook Nov. 10. The post has since been shared 2,722 times and liked more than 29,580 times.